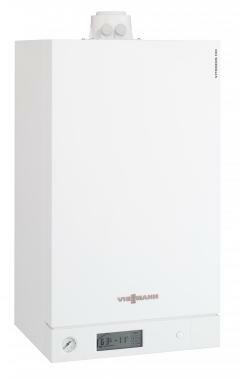 The B1kC Vitodens 100-w is a combi gas boiler that is made and manufactured by Viessmann. It is a condensing and wall mounted unit. This is a highly efficient boiler that is controlled with a backlit LCD touchscreen, which makes it perfect to be installed in a kitchen cupboard or somewhere dark. With this unit also comes a modulating ratio, over the entire range of boilers, that is up to 1:6 - this high ratio makes the boiler perfect for the smaller homes like apartments or well insulated buildings. This gas-fired boiler is from 4.7 to 35kW and comes with a high efficiency rating of 89.2% meaning that it is in an energy efficiency class B. This model has an output of 19kW. It comes with many advantages such as its modulating cylinder burner as well as its constant temperature control and when installed with the outside temperature sensor it has a weather compensated operation, making it perfect for you to never have to come home to a cold house again. This boiler as a standard comes with a 5 year warranty to give you the added security that you have purchased a reliable boiler.